Many condominiums along our beaches and water front from Pass-a-Grille to Madeira Beach, Belleair, Indian Rocks, downtown St.Petersburg, and beyond are in great locations with spectacular views, but have been around for a long time. Don’t let the style or design of a condo prevent you from purchasing or enjoying it to the fullest extent. If you’re living in or recently purchased a condo that needs updating, let us help. Silver Palms Remodelers has experience as a condo remodeling company and is a Certified Remodeler through the National Association of the Remodeling Industry (NARI). We understand that each condo association has different regulations and we will abide by each of those. We want you to love the work we do so we strive to be as unobtrusive to you and your neighbors as possible. Lifestyles change and many of those original designs don’t work for today’s retirees or are simply tired and outdated. If you have inherited or recently purchased a condo that just doesn’t work for the way you live, let us help. One of our specialties is working with couples to make their condo work for them. Many condo owners feel stuck with their kitchen believing that because they are in a condo they can’t make the changes they want. That’s not completely true. Although there are more limitations to condo remodeling than a house might have, we will work with you to improve the counter space, storage or even flow of the kitchen. 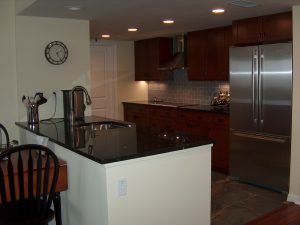 In many cases simply by modernizing and opening up the kitchen you can improve the flow of the space. One of our most common projects is to make a bathroom safer for an aging family member. We can upgrade the flooring from the slick builder grade tile to a less slick flooring surface and install stylish yet functional grab bars. Bathroom remodeling for safety reasons doesn’t have to look institutional. However, if you’re just looking to create a spa like atmosphere in your bathroom, we use great looking, quality products in all our projects. If you need to remodel your entire condo, we want to help you from the front door to the lanai. Because we have experience as a custom builder, we can do everything from design through execution. Let Silver Palm Custom Homes & Remodeling be your condominium remodeling company. Call us today at (727) 420-6693.